I am one of countless women battling disastrously huge pores and day-ruining shine, which is what led me to ask for Benefit Some Kind-A-Gorgeous to be included in my Christmas day loot. Did I like it? Read on for the review! The first thing that drew me to the Benefit product line was the same thing that made me a sucker for Philosophy a couple of years ago; cute packaging. I love creative labels and witty advertising, so Benefit quickly worked its way up my Amazon wish list ladder. Some Kind-A-Gorgeous was one of my first ventures into the Benefit family of products. Pros *The coverage was impressive. I was able to smooth out my complexion without having to apply a lot of the product, and it made my skin matte and a totally shine-free. *No heavy fragrance. Following application, my skin didn't smell like a cosmetics counter. Some Kind-A-Gorgeous stayed low profile and didn't give away to anyone (including husband), that I was trying a new brand of makeup. *Uber cute packaging. Done up like a vintage record, Benefit definitely gets points for creativity. The compact itself is also super convenient, with the top holding the makeup and a special bottom compartment holding the application sponge. I can definitely throw this into my purse and be on my way, which is vital since I am busy enough for three lives. *Streaks Once I got outside and did a primping check in my rear view mirror, I noticed the makeup had formed orange streaks on my neckline. I love looking tan, but orange is not in my ideal color palette. Some Kind - A- Gorgeous comes in a "one size fits all" shade. Newsflash: I didn't fit. Note, however, that blending did solve the problem. *Cheaper brands may fit the bill. Other (read cheaper) cover-ups I have used did a good job of minimizing my pores. This did not. They were just darker. *Messy application. The applicator sponge left a mess on my hands, making it not so ideal for travel after all. You don't require a rush job. If you aren't constantly on the go and actually take the time to check for orange streaks before your lunch date, then you will be able to use this just fine. You aren't fair-faced. I was just too pale for the coloring, but if you want to have it on hand for a post-tan concealer or if you are naturally darker, you will appreciate its level of coverage and color matching. You are looking for an adorable gift for someone else. I recently got more Benefit products as stocking stuffers, and I will definitely use them. Even if it isn't my favorite makeup, I loved the above mentioned cute factor and always look forward to discovering their new products. Benefit Cosmetics Some-Kind-A-Gorgeous won't break the bank. It isn't the most inexpensive makeup around, but for $10-30 a pop, it definitely isn't high-end either. We just bought a house and we are far from millionaires, and this is makeup I can afford to wear while signing those mortgage checks. Their official website is also friendly and easy to use. You can order all sorts of goodies for yourself or someone else here, (they also sell the stuff at Macy's and Sephora), and they also feature an easy re-order page that saves your brain power for more important things like budgeting. So what does Benefit have to say about this product? 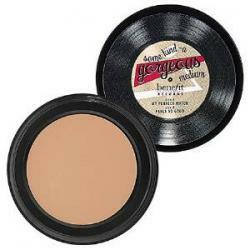 They describe it as an "amazing foundation faker", a cream-to-powder formula that leaves skin silky and even. Okay, I can agree with that. But beware of Operation Orange when using! They also brag about the fact it was voted Best Foundation by Brides magazine and is able to blend into most skin tones. Again, not mine. But it came in as a close second. If I were a bride, I'd vote for you, Benefit.